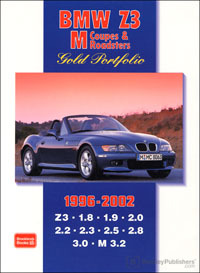 This BMW Z3 M Coupes & Roadsters Gold Portfolio: 1996-2002 is a collection of 47 original articles compiled from the pages of various automotive magazines. The information collected in these reprinted articles includes road tests, specifications, touring and long-term reports. "In 1999, the world's best-selling roadster wasn't the long running Mazda Miata but rather BMWs Z3. Whoda thunkit? But it's true"
So wrote Road & Track in its 2000 Buyer's Guide. Included are road and comparison tests, new model reports, a 'buying used' feature plus full technical and performance data on all the 4 & 6 cylinder Z3's, M Roadsters and Coupes. A total of 160 pages including 45 in full colour.